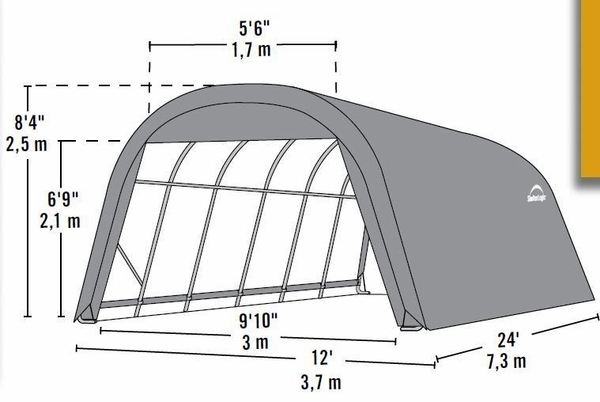 Think that garage tents are fixtures that are simply too big to move around? Think again! Shelter Logic has managed to design a portable garage that you can move to whatever location you need it at any given time. 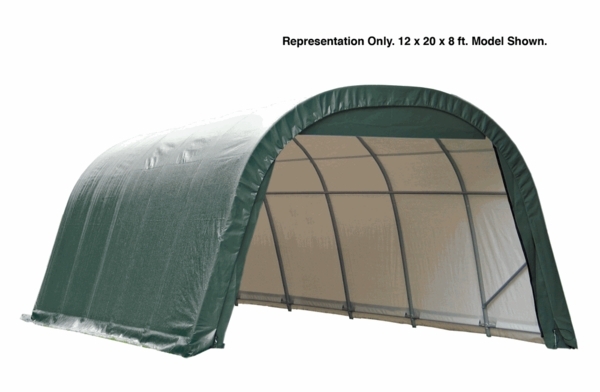 Covering the dimensions of 12 feet by 24 feet by 8 feet, the Round Portable Garage Canopy comes in the color of green and is designed to provide for you all that you need it when the time comes for it to be called into service. Can this canopy handle snow? This unit is not snow/wind rated. Please view our snow/wind rated shelters here. Do you have a replacement top and door for this item? Unfortunately, we do not carry this replacement cover. You will need to contact ShelterLogic using this link. I have one of these. How much tension should be on the top cover? The ribs on mine are very visible and appear to be under a lot of tension. I'm concerned that, over time, it will rip. There should be enough tension on the top to keep it tight and not allow any rain or sediment to collect in any loose areas. However, this should not be stretched painfully tight over the frame. You may need to loosen the ratchets at the bottom of the frame. Does the top center beam go over the side ribs or under ? According to the installation diagram, the top beam goes under the side ribs. Does this have a door on both ends? Yes, both ends have double zippered door panel access. Yes, there are zippered doors at both ends. I am very happy with this product. Does this come with the light weight 9oz or heavy weight 14.5 once fabric? If it is the lightweight fabric, how much for the heavy weight? It comes with the 9 ounce fabric and we do not have the option to change to the heavier fabric. This unit features a 1 year warranty. However, this unit and most like it have a 8-10 year life expectancy of properly maintained. We bought this 3 years ago, but we need a way to raise the flap to make it easier to drive car in. Do you have something? Certainly. We carry the Shelter Logic Door Roll Up Kit. The overall design and concept is well thought out. I was somewhat disappointed to find the tubing and bolts were not as heavy as I expected. I am hoping the round design will serve under snow better than the traditional house type roof that I have had in the past. While two people can set this garage canopy up over a day, I would suggest a team of four would be better. I've seen a few of these where I used to work so I pretty much knew what to expect. Knowing the quality was a major factor in why I bought a Shelter Logic and I am extremely impressed with the turnaround and service from eCanopy. The free shipping was really a plus, too. ProsFast and free shipping. Great quality and value for the money. Durability seems really great, as well. ConsCould use a bit more clarity in the instructions. A few photos would be helpful. ProsIt is what the description says it is. Seems to go together smooth. ConsDirections where a bit vague. Frame was not as strong as I had hoped. This is a great storage unit for this price. I own a 12x20x8 shelter which I've had for 6 yrs.